VATICAN CITY (CNS) — With a simple tap, Pope Francis joined Instagram and quickly set a record for gaining 1 million followers. The launch of the “Franciscus” account March 19, the feast of St. Joseph and the third anniversary of the formal inauguration of his papacy, was preceded by huge media coverage. But still, he hit the million-follower mark in just 12 hours, making his “our fastest growing account on Instagram to date,” said Stephanie Noon, an Instagram spokeswoman. The pope broke the record held for almost a year by former soccer star David Beckham, who took twice as long to gather 1 million followers. “Twiplomacy,” an annual study conducted by the communications firm Burson Marsteller, found Pope Francis — through his @Pontifex accounts in nine languages — to be the most influential world leader on Twitter three years running. U.S. President Barack Obama has more followers, but Pope Francis’ average “retweet” and “favorite” rate is more than eight times higher than Obama’s. 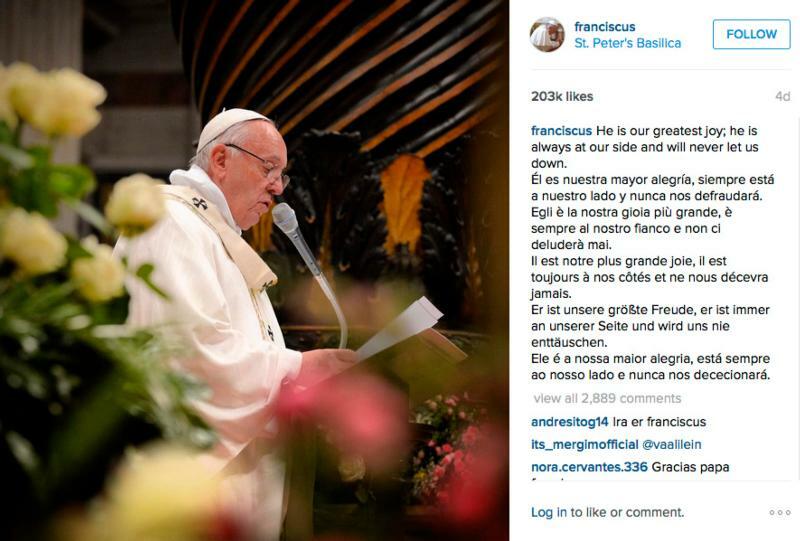 Pope Francis’ Instagram account is showing a similar pattern. The 17 photographs and two video clips posted by early morning March 31 had an overall average of 212,200 “likes” and 6,299 comments each. The photos on the Franciscus account are taken by photographers at L’Osservatore Romano, the Vatican newspaper. They are posted by staff at the Secretariat for Communications. While the @Pontifex twitter account is “institutional” — it was launched by now-retired Pope Benedict XVI in 2012 — the Vatican’s choice of the more personal “Franciscus” as the account name was dictated by reality of the platform, Msgr. Vigano said. After settling down for a few days, the comment rate on the pope’s account spiked March 29 after the Vatican posted a video clip with the hashtags tenderness, mercy and Catholic. The video opened with the pope blessing the obviously pregnant belly of a woman and included scenes of a little boy taking the pope’s zucchetto and Pope Francis and retired Pope Benedict XVI greeting each other. The more than 6,300 comments it attracted remarked particularly on the beauty of the gestures and expressed enthusiasm for Pope Francis. The video was among the first on Instagram to be 60 seconds long, Msgr. Vigano said. The social media company had just announced that day that gradually users would be able to exceed the previous 15-second limit. Father Spadaro also said members of the Instagram “community,” like many people today, take photographs primarily to share an event rather than to preserve a memory. “Who looks through old photos anymore?” he asked. “A beautiful photo isn’t necessarily a perfect photo,” Father Spadaro said. A strong picture “communicates an event and emotion,” which in people’s photos of the pope can have a strong impact even if they are out of focus or taken from far off.